Since 1988, we have been designing and selling cabinetry for kitchens, baths, libraries and entertainment centers in some of the area's finest homes. We invite you to browse through the architecturally detailed and accessorized displays of traditional and contemporary cabinetry in our 3200 square-foot studio in the Shoppes at Parkview Hills. Here, you will find cabinetry, countertops, one of the area's largest selections of bath and cabinet hardware, as well as accessories for the kitchen and bath. We have built our reputation on service, special attention and customer satisfaction. We are proud of our quality products and professional design staff. We listen to your ideas, understand your needs and work with your budget. When you work with us, we're part of your team. Feel free to reach out to us, we would love to hear from you! *Authorized Woodharbor Cabinetry Dealer* Hi, my name is Carlie Korinek. I began my career with a small kitchen and bath design firm in 1998 while in college. I graduated from Northern Arizona University with a Bachelor of Science degree in Interior Design and remained at the same small firm for 16 years until I started my own kitchen and bath design business in 2014. My studio is located inside Granite Kitchen and Bath's showroom and I offer a wide array of cabinetry and decorative hardware. I am a Certified Kitchen and Bath Designer (CKD) through the National Kitchen and Bath Association (NKBA). 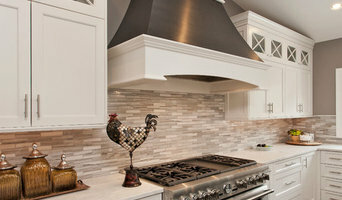 I work with clients to plan their kitchens and baths both for new construction and remodeling projects. I pride myself in space planning and being able to see the potential a space has and bringing that to life for my clients with quality products, service and installation. I also work on many other areas while doing kitchen and bath projects such as dining rooms, family rooms, bedrooms, laundry rooms, offices and entertainment areas.